The Electron Microscopy Core Facility provides technical support for electron microscopy (EM) sample preparation, training in the use of electron microscopes and other technologies in the lab, and collaborates with researchers in the design of EM experiments and data interpretation. 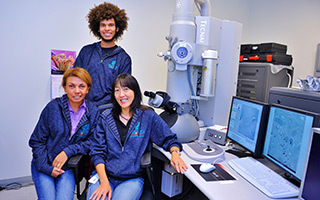 The Electron Microscopy Core develops novel techniques alongside investigators to overcome limitations in research projects, providing services to scientists throughout the state. The facility also actively participates in MPFI’s education outreach initiatives through training high school and undergraduate interns in EM techniques and technologies. On-going research with the Electron Microscopy Core continues to develop dedicated cutting-edge technologies to visualize brain structures. Combining Structure and FunctionTechniques are currently being developed in correlative light-electron microscopy (CLEM), a method of microscopy that combines structural and allows imaging of a sample under a fluorescence microscope and subsequently an electron microscope. This technology combines the powerful data obtained from imaging fluorescent proteins in living cells with the ultrastructural detail of electron microscopy that can differentiate between various structures such as an organelle, an organellar sub-domain, or an aggregate of proteins. Phan A, Thomas CI, Chakraborty M, Berry JA, Kamasawa N, Davis RL. (2019). Stromalin Constrains Memory Acquisition by Developmentally Limiting Synaptic Vesicle Pool Size. Neuron 2;101:103-118.e5. Lübbert M, Goral RO, Keine C, Thomas C, Guerrero-Given D, Putzke T, Satterfield R, Kamasawa N, Young SM Jr. (2018). CaV2.1 α1 Subunit Expression Regulates Presynaptic CaV2.1 Abundance and Synaptic Strength at a Central Synapse. Neuron pii: S0896-6273(18)31037-7. Dong, W., Radulovic, T., Goral, R.O., Thomas, C., Suarez Montesinos, M., Guerrero-Given, D., Hagiwara, A., Putzke, T., Hida, Y., Abe, M., Sakimura K., Kamasawa N., Ohtsuka T., Young S.M. Jr. (2018). CAST/ELKS Proteins Control Voltage-Gated Ca2+ Channel Density and Synaptic Release Probability at a Mammalian Central Synapse. Cell Reports 24, 284-293.e6. Sarria, I., Cao, Y., Wang, Y., Ingram, N.T., Orlandi, C., Kamasawa, N., Kolesnikov, A.V., Pahlberg, J., Kefalov, V.J., Sampath, A.P., Martemyanov, K.A. (2018). LRIT1 Modulates Adaptive Changes in Synaptic Communication of Cone Photoreceptors. Cell Rep 22, 3562–3573. Grassi, D., Howard, S., Zhou, M., Diaz-Perez, N., Urban, N.T., Guerrero-Given, D., Kamasawa, N., Volpicelli-Daley, L.A., LoGrasso, P., and Lasmézas, C.I. (2018). Identification of a highly neurotoxic α-synuclein species inducing mitochondrial damage and mitophagy in Parkinson’s disease. PNAS, Published ahead of Print Feb 27, 2018. Lübbert, M., Goral, R.O., Satterfield, R., Putzke, T., Maagdenberg, A.M. van den, Kamasawa, N., and Jr, S.M.Y. (2017). A novel region in the CaV2.1 α1 subunit C-terminus regulates fast synaptic vesicle fusion and vesicle docking at the mammalian presynaptic active zone. eLife Sciences 6, e28412. Neuillé, M., Cao, Y., Caplette, R., Guerrero-Given, D., Thomas, C., Kamasawa, N., Sahel, J.-A., Hamel, C.P., Audo, I., Picaud, S., et al. (2017). LRIT3 Differentially Affects Connectivity and Synaptic Transmission of Cones to ON- and OFF-Bipolar Cells. Investigative Ophthalmology & Visual Science (IOVS) 58, 1768–1778. Rubio, M.E., Matsui, K., Fukazawa, Y., Kamasawa, N., Harada, H., Itakura, M., Molnár, E., Abe, M., Sakimura, K., and Shigemoto, R. (2017). The number and distribution of AMPA receptor channels containing fast kinetic GluA3 and GluA4 subunits at auditory nerve synapses depend on the target cells. Brain Struct Funct. [Epub ahead of print]. Wang, Y., Fehlhaber, K.E., Sarria, I., Cao, Y., Ingram, N.T., Guerrero-Given, D., Throesch, B., Baldwin, K., Kamasawa, N., Ohtsuka, T., et al. (2017). The Auxiliary Calcium Channel Subunit α2δ4 Is Required for Axonal Elaboration, Synaptic Transmission, and Wiring of Rod Photoreceptors. Neuron 93, 1359–1374. Peach, K., Koch, M.S., Blackwelder, P.L., Guerrero-Given, D., and Kamasawa, N. (2017). Primary utricle structure of six Halimeda species and potential relevance for ocean acidification tolerance.Botanica Marina – DE GRUYTER. Mikuni, T., Nishiyama, J., Sun, Y., Kamasawa, N., and Yasuda, R. (2016). High-Throughput, High-Resolution Mapping of Protein Localization in Mammalian Brain by In Vivo Genome Editing. Cell, 165, 1803–1817. Montesinos, M., Dong, W., Goff, K., Das, B., Guerrero-Given, D., Schmalzigaug, R., Premont, RT., Satterfield, R., Kamasawa, N., Young, SM, Jr. (2015) Presynaptic Deletion of GIT Proteins Results in Increased Synaptic Strength at a Mammalian Central Synapse. Neuron, 88, 918–925. Cao, Y., Sarria, I., Fehlhaber, K.E., Kamasawa, N., Orlandi, C., James, K.N., Hazen, J.L., Gardner, M.R., Farzan, M., Lee, A., Baker, S., Baldwin, K., Sampath, A.P., Martemyanov, K.A. (2015). Mechanism for Selective Synaptic Wiring of Rod Photoreceptors into the Retinal Circuitry and Its Role in Vision. Neuron 87, 1248-1260. Kamasawa, N., Sun, Ye., Mikuni, T., Guerrero-Given, D., Yasuda, R. (2015) Correlative Ultrastructural Analysis of Functionally Modulated Synapses Using Automatic Tape-Collecting Ultramicrotome – SEM Array Tomography. Microscopy and Microanalysis 21, Supplement S3, 1271-1272. Nakamura, Y., Harada, H., Kamasawa, N., Matsui, K., Rothman, J.S., Shigemoto, R., Silver, R.A., DiGregorio, D.A., Takahashi, T. (2015). Nanoscale Distribution of Presynaptic Ca2+ Channels and Its Impact on Vesicular Release during Development. Neuron 85, 145-158. Rash, J.E., Kamasawa, N., Vanderpool, K.G., Yasumura, T., O’Brien, J., Nannapaneni, S., Pereda, A.E., Nagy, J.I. (2015). Heterotypic gap junctions at glutamatergic mixed synapses are abundant in goldfish brain. Neuroscience 285, 166-193. Rubio, M.E., Fukazawa, Y., Kamasawa, N., Clarkson, C., Molnar, E., and Shigemoto, R. (2014). Target- and input-dependent organization of AMPA and NMDA receptors in synaptic connections of the cochlear nucleus. J Comp Neurol. 522, 4023–4042. Schaudinn, C., Stoodley, P., Hall-Stoodley, L., Gorur, A., Remis, J., Wu, S., Auer, M., Hertwig, S., Guerrero-Given, D., Hu, F.Z., Ehrlich, G.D., Costerton, J.W., Robinson, D.H., Webster, P. (2014). Death and transfiguration in static Staphylococcus epidermidis cultures. PLoS ONE 9(6)e100002. Wu, S., Li, X., Gunawardana, M., Maguire, K., Guerrero-Given, D., Schaudinn, C., Wang, C., Baum, M.M., Webster, P. (2014). Beta- lactam antibiotics stimulate biofilm formation in non-typeable haemophilus influenzae by up-regulating carbohydrate metabolism. PLoS ONE 9(7) e99204. Wu, S., Baum, M.M., Kerwin, J., Guerrero, D., Webster, S., Schaudinn, C., VanderVelde, D., Webster, P. (2014). Biofilm-specific extracellular matrix proteins of nontypeable Haemophilus influenzae. Pathogens and Disease 72, 143-160. Shih, P.-Y., Savtchenko, L.P., Kamasawa, N., Dembitskaya, Y., McHugh, T.J., Rusakov, D.A., Shigemoto, R., and Semyanov, A. (2013) Retrograde Synaptic Signaling Mediated by K+ Efflux through Postsynaptic NMDA Receptors. Cell Reports 5, 941–951. Rash, J.E., Curti, S., Vanderpool, K.G., Kamasawa, N., Nannapaneni, S., Palacios-Prado, N., Flores, C.E., Yasumura, T., O’Brien, J., Lynn, B.D., et al. (2013). Molecular and Functional Asymmetry at a Vertebrate Electrical Synapse. Neuron 79, 957–969. Indriati, D.W., Kamasawa, N., Matsui, K., Meredith, A.L., Watanabe, M., Shigemoto, R. (2013). Quantitative localization of Cav2.1 (P/Q-type) voltage-dependent calcium channels in Purkinje cells: somatodendritic gradient and distinct somatic coclustering with calcium-activated potassium channels.. J. Neurosci. 33, 3668-3678. Budisantoso, T., Harada, H., Kamasawa, N., Fukazawa, Y., Shigemoto, R., Matsui, K. (2012). Evaluation of glutamate concentration transient in the synaptic cleft of the rat calyx of Held. J Physiol. 591, 219-39. Rash, J.E., Kamasawa, N., Davidson, K.G.V., Yasumura, T., Pereda, A.E., and Nagy, J.I. (2012) Connexin Composition in Apposed Gap Junction Hemiplaques Revealed by Matched Double-Replica Freeze-Fracture Replica Immunogold Labeling. J Membr Biol. 245, 333–344. Cao, Y., Pahlberg, J., Sarria, I., Kamasawa, N., Sampath, A.P., and Martemyanov, K.A. (2012) Regulators of G protein signaling RGS7 and RGS11 determine the onset of the light response in ON bipolar neurons. PNAS 109, 7905–7910. Budisantoso, T., Matsui, K., Kamasawa, N., Fukazawa, Y., and Shigemoto, R. (2012) Mechanisms Underlying Signal Filtering at a Multisynapse Contact J. Neurosci. 32, 2357–2376.